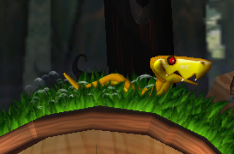 Cling Cobras, also referred to as Wiggles[page number needed], are cobra-like enemies in Donkey Kong Country Returns and Donkey Kong Country Returns 3D, found only in one level of the Forest world, Clingy Swingy. They cling on to grassy areas, waiting to slither into Donkey Kong and Diddy Kong, damaging them if they make contact. They may even make the two Kongs lose their balance, causing them to fall down from the grassy area they are holding onto. Their body is yellow and orange, they have brown eyes, and they possess large, sharp teeth in their mouth. The Cling Cobra's name is derived from the animal, the "king cobra", which is a real world venomous snake. ↑ Knight, Michael. Donkey Kong Country Returns Prima Official Game Guide. Page 26. ↑ Knight, Michael, and Alex Musa. Donkey Kong Country Returns 3D Prima Official Game Guide. This page was last edited on September 9, 2018, at 15:20.